RockKenny wrote: What kind of 7660 do you use? I mean firs letters. Just 7660SCPAZ. Not SCPA but SCPAZ. No letters before digits. Bought it here, check the picture of the chip. Any ideas where to buy C25k potentiometers (split shaft preferably) in decent price and (would be nice) in EU? I'm beginning to study this pedal, and I have some doubts and questions about it. I know about some oscillation problem and I'm a bit worried. I even know about the 560pf cap, which can replace the 47pf, but maybe getting the sound muddy. I'll pay attention to the 7660 version, too. I never did, but I could use the shielded cable, if I need. I prefer and I would like make the board by myself and not to buy a PCB. I probably gonna build (not within few months) the veroboard layout by Guitar FX, and it's clear, I would make a perfect working pedal and the veroboard layout results verified, but did someone build it with none of this problem? And now a technical question. I see the charge pump, and also a 12v regulator, right? The PSU of this pedal can be 12v or 18v. I suppose the pedal receive 12v or 18v, adjust it at 12v and the charge pump turn into 24v. Is it correct? 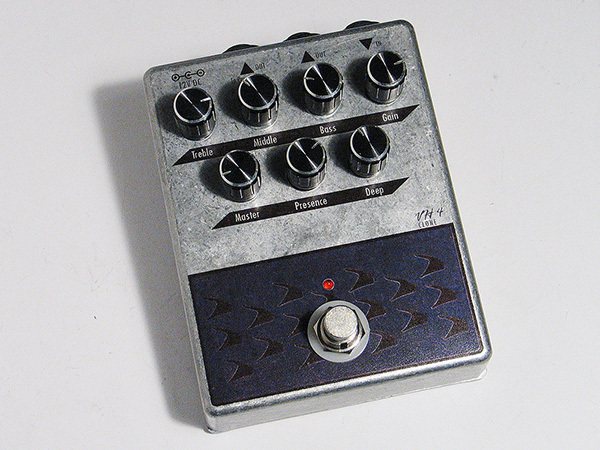 I just built this pedal from bajaman's PCB design. I had horrible oscillations when gain was above 60%. This disappeared completely after changing C10 from 47pF to 22000pF mylar cap. It did decrease the overall gain quite a bit though. I tried the 7660S and LT1054 in IC4. It was overall noisier and loudy with LT1054 but did not decrease tendency to oscillate. No different in sound or oscillation between 12V or 18V sound. I tried twisting +/- leads and tidying the wiring. No difference. It seems the oscillations and some related pre-oscillation noise change threshold based on: Gain knob, Depth knob, Mid knob, and general position of PCB relative to pots. Beyond my ability to sort out why. Now, the pedal works fine but there is a loud whooshing hum when master volume is up. Even with noise gate in front and guitar disconnected. Also there is some ground-related hum/buzz that goes away when I play or touch my guitar strings. So of the 4 noise types (oscillation sequel, pre-oscillation noise, ground-hum, and volume-related-whooshing), 2 were fixed by tidying wiring in increasing C10. 1. How can I decrease Ground-hum and whooshing? 2. Should I put a ferrite bead in R1 as was on the original? 3. Should I build a buffer onto a daughter board before the input? 4. How can I make the master volume knob less touchy? (With it going into my FX return, I can only use 0% to 5% without bothering neighbors). Ichabod_Crane wrote: And now a technical question. I see the charge pump, and also a 12v regulator, right? The PSU of this pedal can be 12v or 18v. I suppose the pedal receive 12v or 18v, adjust it at 12v and the charge pump turn into 24v. Is it correct? 7660 has an input operating range of something up to 12 volts. So, guys from diesel decided to use voltage regulator to protect 7660 chip. Some people use zener diodes for it, some prefer linear regulators. Both of them can be easily omitted if you plan to use the pedal with regulated power supply not exceeding 12v voltage. I suppose, this pedal feeds of 9 volts normally, you can try and feed it with 12 volts, but it won't make any reasonable change. Well, I assume that if the Diezel works after the power section at 24v (in case of 12v/18V PSU) instead 18v (in case 9v PSU) the pedal will have more headroom, so a bit of volume and maybe a bit of more clear and bright sound. Actually, I don't have experience with this kind of stuff, but is this what I read around. I'm sorry, PittedPanda. This is right the things I wouldn't get with my build. Did someone build it (the Guitard FX veroboard layout) with none of these problems? And there it is, finally finished. Proper pots (Presence and Deep), decal. Ichabod_Crane wrote: , I would make a perfect working pedal and the veroboard layout results verified, but did someone build it with none of this problem? I just built the veroboard version. No sound. The layout has 2 errors at the first op-amp stage; and I still got 5 stages more to go with potential problems. It's declared verified. A guy built it, and he said it sounds great. Indeed, I would have some more opinions about it, and eventually issues or tricks. I can't see any and the layout has been verified. If there are, you should have the decency to mention them on the Tagboard blog so that they could be corrected instead of writing here that the layout is crap. Looking forward to your better "uncongested" version. Not sure about noise level (increasing the 47p may help) but my layout matches the schematic and it has already been verified by two different people. Once again: what were those errors you were talking about? 2 problems. I am getting +12v and +7v at the op amps. Had so much problem with the 7660; after burning up a couple and bought 4 more. Tested them on a test board; not one gives -12V . Gave up on charge pump, and substituded with a virtual ground power supply. Perhaps too overkill, but now the pedal works fine. temol wrote: And there it is, finally finished. Proper pots (Presence and Deep), decal. Since i'm interested in building this and it'll be my first pedal, should i buy the UK-electronic or can i save some by buying all the parts myself? This is probably used to comply with the CE-Standards in Europe. R28 is a 1K resistor. This is not correct since all the resistors are clockwise mounted on the original PCB. R28 has the colors brown, black, black, black, Brown. So this is not 1K, but 100 Ohms. Hard to say.. it depends on where you buy the parts, from how many suppliers, etc. Might be easier and cheaper to buy a kit. btw - not the easiest subject for a first build. Ichabod_Crane wrote: I'm beginning to study this pedal, and I have some doubts and questions about it. I can only tell you my story and that is that I was able to fix self-oscillation by rewiring my pots. The V84 was my first really "complex high gain" pedal and i haven't been aware of the TL072 sensitivity to capacitance on the output pin. Neither did I know that "twisting the pot cables and keeping them long enough to easily fit" would introduce a shitload of capicitance through the tone and volume stack. TLDR: I rewired all of the pots with untwisted cables at minimum length so I could still fit it in the housing and now it works fine in terms of self-oscillation. bajaman wrote: Uwe has put together a complete kit of parts with an excellent pdf builder's manual too!